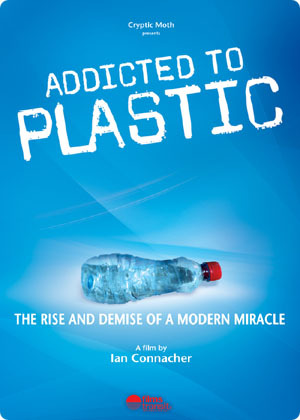 ADDICTED TO PLASTIC is a feature-length documentary about solutions to plastic pollution. The point-of-view style documentary encompasses three years of filming in 12 countries on 5 continents, including two trips to the middle of the Pacific Ocean where plastic debris accumulates. The film details plastic's path over the last 100 years and provides a wealth of expert interviews on practical and cutting edge solutions to recycling, toxicity and biodegradability. These solutions - which include plastic made from plants - will provide viewers with a hopeful perspective about our future with plastic. Airs Monday January 5, 2009 at 10 P.M. on CBC Newsworld – The Passionate Eye. ADDICTED TO PLASTIC! The Rise and Demise of a Modern Miracle 85 min., Canada, dir. Ian Connacher | Reviewer J H Stape Sat, 4 October at 9.30pm Empire Granville 7 Theatre 2 Sun, 5 October at 4.30pm Empire Granville 7 Theatre 2 Thurs, 9 October at 9.30pm Vancity Theatre Slick, hard-hitting, and even witty, this film with a message begins with a horror story -- the pollution wrought by petrochemical plastics and their worldwide dispersal -- and ends with a slim glimmer of hope in the work of scientists on bio-plastics. And when you see your first bio-degradable cellphone, you know this is, if not quite, round the corner at least in prospect of "the next decade or so" kind. Brilliantly edited, with a crisp text, and impressively filmed, this is a minor classic of its kind, avoiding easy targets (well, we're all involved, even if you say "Paper" at the local shop) aside from the plastics industry, whose greed of course knows no bounds, but that, so it is predicted, will end up paying like the tobacco industry: in the meantime, of course, birds and fish ingest it, the oceans are becoming a chemical soup, the well-intentioned are conned: recycling makes nary a dent, because the stuff just won't disappear, it comes baaack from the dead even as more and more is created everyday! Polished and informative, this is a must see for anyone with the slightest grain of environmental concern. You do wonder though about the size of this film's own "carbon footprint" as it flips from Holland to India to Africa. That worry aside, Ian Connacher packs a real punch as director-narrator. And, yes, I said "NO!" to plastic at Choices Foodstore today. After seeing this film, you will too.